I didn’t watch much of the Academy Awards ceremony on Sunday. The only parts I saw were broadcast on large televisions in the restaurant where I ate dinner. The one bit that caught my attention was the big, funny goof: The emcee escorted a surprised group of Hollywood sight-seers out of their tour bus and into the front of the Dolby Theater. 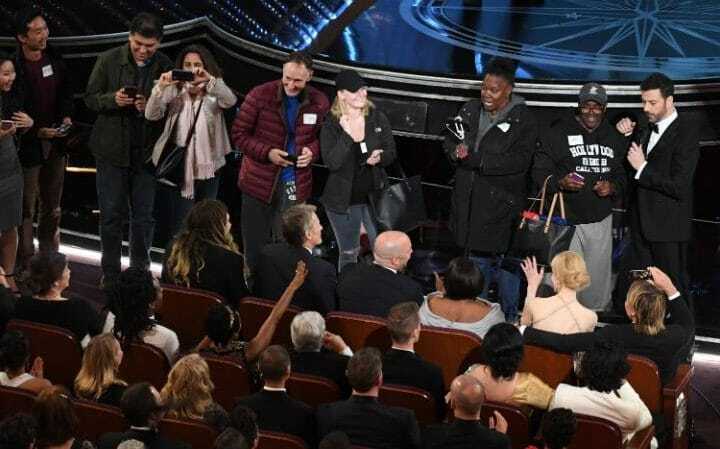 As 33 million people watched on live television, people wearing sweatshirts, shorts and dirty sneakers were received graciously by smiling movie stars in black tie and designer gowns. The celebs had a chance to prepare for the cameras — Leonardo DeCaprio had a stylist flown in from Australia to do his eyebrows, for instance — but the poor tourists didn’t even get a chance to comb their hair. The purpose seems to have been to show members of the academy mixing it up with common folk. There is some precedent for this; Marie Antoinette used to enjoy dressing in muslin and pretending to be a milkmaid. And wasn’t it gracious of Nicole Kidman to let the guy in the Hollywood sweatshirt kiss her hand? To be fair, the sweatshirt guy didn’t seem to mind. Maybe he didn’t even mind the next day when it came out that he had been released from prison just three days earlier. That seems like the kind of information that should be between him and his parole officer, not shared by newspeople who cover red-carpet events. But what do I know? I’m not interested in selfies with celebrities. I would feel ambushed if I were brought into a fancy-dress event in my jeans, even the designer pair and even if the celebrities smiled sweetly at me. Especially if the celebrities smiled sweetly at me. Ugh. There’s a word to describe this kind of stunt: gauche.